Optimum-Energy Communities: Moving Towards Zero Dirty Energy! All human activities require energy, most (88%) of which is supplied by converting stored energy in fossil fuels, dirty energy (DE), to mechanical power, electricity, heat and greenhouse gases [as well as food.] More than two-thirds of of the total energy supplied is lost as waste (see Chart W.3). The rate of pollution is exponentially proportional to the consumption of DE. Throughout 2007 burning of fossil fuels released 31,775.04 million metric tons of carbon dioxide to the atmosphere. [Total emissions for 2007 including cement production and tropical deforestation were 38,058.66 MMT of CO2.] – See also: New York Cognitive Dissonance. To prevent the complete collapse of ecosystems, we believe, based on our dynamic energy models, the global energy consumption must be reduced rapidly to about 60EJ, with the fossil fuels consumption approaching zero. 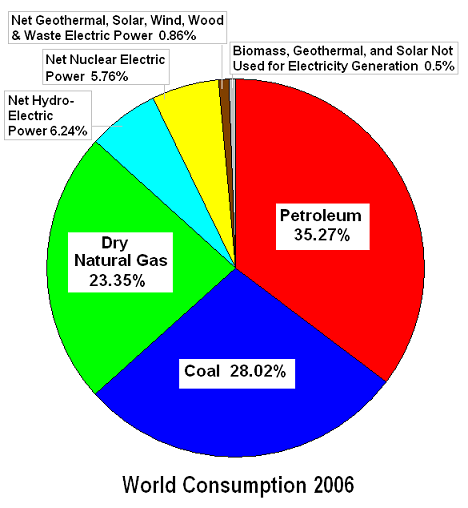 This level of consumption is about 11.9 percent of global energy consumption in 2006. What are you doing here/ what do you plan to achieve? How long are you staying on? 1. Establish intelligent communities to provide food, basic amenities, education, jobs and security. The communities would serve as contemporaneous blueprints to help redesign, rearrange and retrofit existing population centers to conform to a global energy policy that rapidly reduces the consumption of fossil fuels to zero. 2. Change the system of economy from an exponential growth economy to the “Great Economy for Community of Life,” a zero-growth, low carbon, waste-free okonomia for managing the environment, welfare of humans and other living species, and a system of ‘housekeeping’ for the planet’s natural resources to ensure sustainability of life on Earth. 5. Redirect all available resources to provide clean air, freshwater, food, shelter, health and education for the world population. The following chart shows the consumption by sector for World, OECD European countries and the United States. Significant savings can be made in all sectors through optimum planning, innovative design, application of appropriate technology as well as lifestyle and behavioral changes. In 2001, lighting consumed 756 Billion kWh – America’s 104 nuclear generating units produced 769 billion kWh, while operating at a capacity factor of 89 percent. It took our entire nuclear fleet to illuminate America. Redesign human-centered communities to substantially reduce/eliminate the need for vehicles [as well as roads and parking lots,] allowing access only to emergency vehicles when necessary. Promote community spirit, discourage atomistic lifestyles. Ensure access to all amenities within walking/cycling distance. Work from home, or walk/cycle 5-10 minutes to your place of work. Create education centers [smart centers would be a combination of physical and virtual facilities—using only sustainable, appropriate technologies,] which include schools for the kids, a library and play area within walking distance. Provide adequate facilities for Internet access [where a sustainable variation of internet-mass communication-technologies could be employed] within the libraries to eliminate the need for individual ownership. Arrange for a health clinic, fitness and recreation center, social gathering hall, entertainment and food centers to be within walking distance. Produce your food locally, to the maximum extent possible. Promote co-housing and sharing of [“essential”] appliances. REM: For every one unit of “useful energy” received more than two units of energy are wasted as heat! Chart W.3. 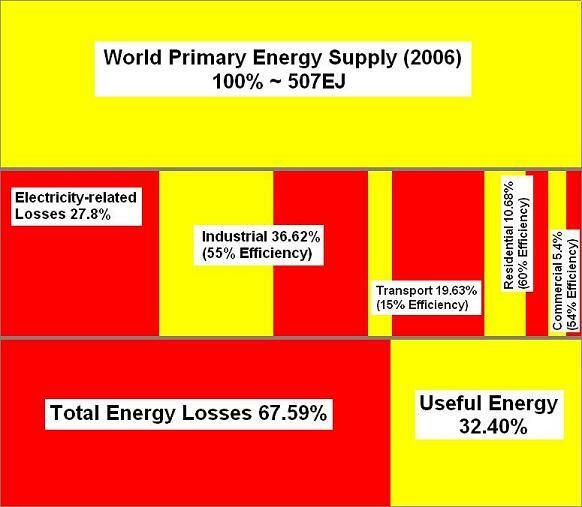 World Energy (2006) – Consumption and Efficiency by Sector (simplified diagram). The key to preventing the next mass species extinction and preserving human cultures is one of creating the opportunity for humans to evolve at very low rates of energy (and material) consumption. There are a number of forced factors why instead of evolving, human intelligence has regressed causing humans to degenerate into grotesque energy monsters. The main reason for the regression is the monetary gains made by the world’s overlords, whose perceived interests are served when more (NOT LESS) energy and materials are consumed. Their interests clearly fly in the face of human survival. There is a whole cosmos of exhilarating possibilities at the low energy end of the consumption spectrum. Humanity has everything to gain and nothing to lose by fully exploring ways and means of how to evolve, and survive rather than become extinct! Failure to take heed of the warning signs would be to the detriment of everyone, their families and their nations—a major threat to survival of human race. Yesterday was the best time to act; today our last option expires; tomorrow is too late! Regaining the will to live! 2. Large numbers of poor people who live in richer countries that receive higher energy quotas, and therefore are not listed in the above table, actually consume less than 258W per capita because most of the energy is consumed by their wealthy class. 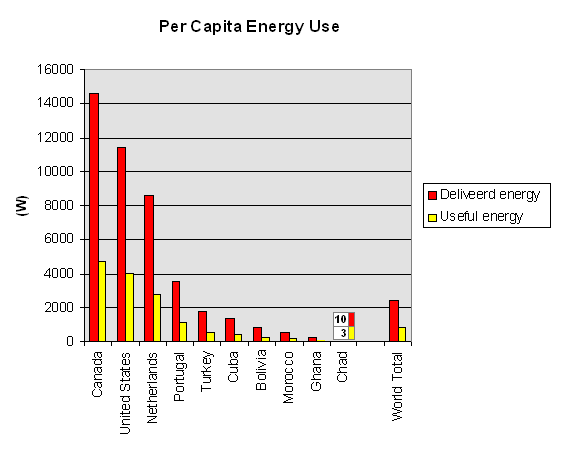 In real terms the number of people who receive per capita useful energy of 258W or lower are probably closer to 65 percent of the world population. The Fate of Energy Dinosaurs: Extinction ! 286 watts per person per day? It reads like 286 per watts per person year? One high efficiency, bulb at 7 watts x 4 hours = 28 watts per day. 286 watts would be one light bulb for a about a week and half. Does this include home and work? How much energy is one joule? Not a lot! If you pick up a small apple (weight of 102 grams) placed atop a table in front of you, while sitting, and raise it above your head (height of 1 meter), you will have used about one joule of energy. She would consume about 25W sitting on a chair, 43W standing in a line and 268W walking on an even path at a speed of 4.5 km/h (2.8 mph). In the 286W Communities, each person uses up to 286joules per second, or a total of 9.025 gigajoules [2.51MWh] per year [one gigajoule is 10^9 joules] without compromising her standards of comfort or destroying the rest of the planets failing ecosystems. The moderators will post a broad definition including the energy breakdown for various applications at the 268W communities soon. The next step would require a rethink and a change of perspective (as well as a little bit of planning). Why not work from the comfort of your home? This reply, which had been hacked, was corrected by Moderator CS on September 3, 2011. Consuming energy at the rate of 286 Watts contin[u]ously and still maintaining a comfortable life is an impossible goal. 286 Watts for 24 hours is roughly 6KWH of energy per day. At present prices of electricity (the most expensive form of energy) at $0.15 per KWH, this means a monthly energy cost of roughly $30. That is not enough to cover the cost of heating a small apartment in the winter located in northern climates. It would require scraping all of our buildings and rebuild them according to the most recent “passive house” insulation levels. The cost of that reconstruction in terms of energy would be astronomical. Renewable energy systems (solar panels) require 10 to 20 years of operation in order to recover the energy spent producing these panels. The solution is to either abandon heating or at least lowering the temperature to the uncomfortable level of less than 60 degrees in the winter. This is definitely possible and we would survive such temperatures (as our grandparents did). However, it would be dishonest to claim that such a temperature level would still represent comfort. 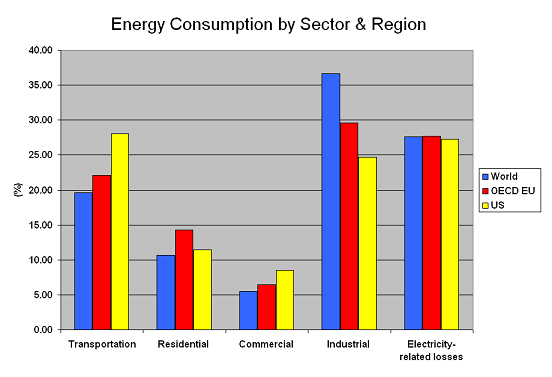 I understand why we need to drastically lower our energy consumption – there is no argument about that. However, we should be realistic about the cost of accomplishing such a goal and also about the quality of life which would be implied about such a low level of energy consumption. Greyzone – IMO, your data is misleading. Please send me the same data for Zambia, a country in Southern Africa. Data and links provided by Carol, CASF Member. How do you arrive at your figure of 60EJ? Where are the details of your model – are they published anywhere? Greg – the figure of 60EJ is based on simulations created by two different models. Details of the models haven’t been published. More often than not I don’t comment on web sites, but I would just like to mention that this article really has forced me to do so! Thank you for your perceptive post.